As with other related rare-earth metals, it is silvery white, has a metallic luster, and is malleable and ductile. At room temperature, gadolinium crystallizes in the hexagonal, close-packed α form. Upon heating to 1235 °C, α gadolinium transforms into the β form, which has a body-centered cubic structure. The metal is relatively stable in dry air, but in moist air it tarnishes with the formation of a loosely adhering oxide film which splits off and exposes more surface to oxidation. The metal reacts slowly with water and is soluble in dilute acid. Gadolinium has the highest thermal neutron capture cross-section of any known element (49,000 barns). Natural gadolinium is a mixture of seven isotopes. Two of these, 155Gd and 157Gd, have excellent capture characteristics, but they are present naturally in low concentrations. 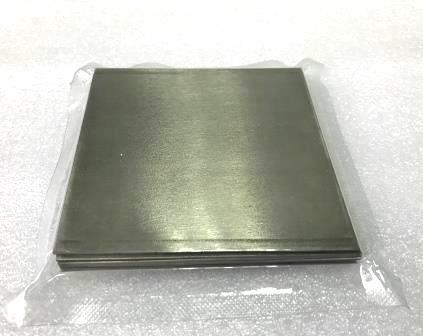 Edgetech Industries LLC provides gadolinium sheet and gadolinium foil with high purity, 0.1 - 40mm thickness. -Gadolinium has been used in making gadolinium yttrium garnets, which have microwave applications. -Compounds of gadolinium are used in making phosphors for color TV tubes. -Gadolinium metal has unusual superconductive properties. -As little as 1% gadolinium has been found to improve the workability and resistance of iron, chromium, and related alloys to high temperatures and oxidation. -Gadolinium ethyl sulfate has extremely low noise characteristics and may find use in duplicating the performance of amplifiers, such as the maser. Our gadolinium sheet carefully handled to prevent damage during storage and transportation. Send your specifications to sales@edge-techind.com. We also supply gadolinium rod, wire and other forms on request.